While Treasure's almost two decade existence has provided a cornucopia of awesome games (good and bad), only a handful of titles have been picked up by the mainstream gaming media. The most famous of these is Ikaruga which might as well be a synonym for vertical scrolling shooting game with how often it's mentioned in comparison to other games (even when it's mostly unwarranted). Also notable are Sin & Punishment which was reappraised after it's Virtual Console re release and it's sequel which is the only good game in the Wii. 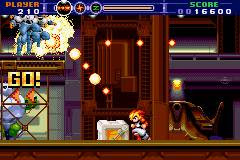 Gunstar Heroes was the first game Treasure made and also one of their best. When it's sequel came out there was surprising minimal fanfare but how would the game turn out? 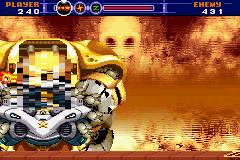 Multiple weapons have been a concept in video games dating as far back as R-Type. Treasure's innovation to this with the original Gunstar Heroes was to introduce weapon mixing. With four weapons this allowed for fourteen weapon combinations at your disposal. Gunstar Super Heroes gives you three fixed weapons to use that you can change between at any time. This seems like a step down from the original game until you realise that the game gives you two of the most powerful weapons from the original game so Treasure can make the game even more challenging than the original. Thie third weapon is dependant on which character you pick. In the original the character you picked depended of whether you wanted to shoot in eight different directions or whether you wanted to shoot while running. There's been a clear effort to streamline the original game which makes this game a sequel by way of a remake. In terms of pandering to nostalgia Gunstar Super Heroes might be Treasure's most fan-service filled game yet. Most treasure games usually have references to their previous games whether their minor (Gunstar bubblegum advertised in the billboards in Astro Boy: Omega Factor) to significant (one of the playable characters in Rakugaki Showtime is Marina from Mischief Makers). This game takes this a whole new level by not only remaking stages from the original Gunstar Heroes but also fully recreating stages from other SEGA games. A segment from the end of the second stage combines the game play of Flicky with the mechanics of Wario Ware: Twisted, the famous Dice Palace stage from the original provides a cavalcade of nostalgia and imagination from Treasure in the finest concentration of ideas that the team has ever done. These parts can come off as incredibly superficial and the claim isn't unwarranted. The game can't make up its mind on whether it wants to be a proper Gunstar Heroes sequel or Wario Ware as done by Treasure. This doesn't detract from what makes the original so much fun in the first place. 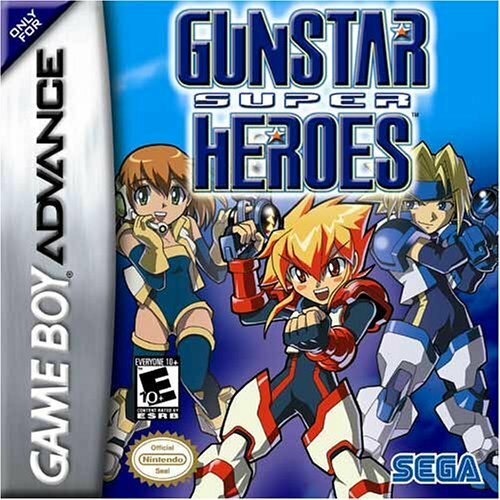 Gunstar Super Heroes has some of the best controls for any action on the GBA with controls being tight and rigid, the boss design remains some of Treasure's best work providing fun experiences that don't overstay their welcome and a soundtrack that sounds like the Mega Drive's sound chip at it's finest. Gunstar Super Heroes isn't one of Treasures best games and as a sequel, it could have been a lot more. But none of that is important as Treasure have managed to create another fun game that no other company is capable of as part of their goal to finally rid peoples minds of Light Crusader once and for all.